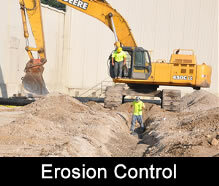 Plybon's Excavating Services provides a variety of demolition and site preparation services. Call us today for a free estimate. 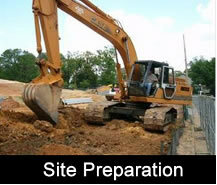 Having a solid, well-prepared site is essential for any size construction project. Plybon's Excavating can help with a variety of preparation projects for residential, commercial and industrial customers in Huntington, WV, and surrounding areas. Whether you are building a large shopping center, an individual home or any project in between, call Plybon's to ensure you are building on a firm foundation. Our trained, experienced staff will work with you to ensure your site is in top shape for your upcoming project. Whether your site is covered with large trees, old buildings, or left over industrial waste, we will follow all regulations and best practices to ensure your site is solid and ready for the next step of construction. The experts at Plybon's Excavating have the equipment and expertise you need to quickly demolish full or partial structures. Dilapidated buildings are an eyesore and a huge liability for the owners. Let us help by tearing down the structure and removing the waste. 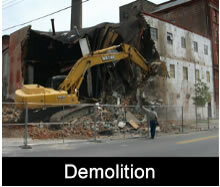 Total Demolition: Whether it's a small or large building, our team will quickly and safely remove it from your site. We work in residential, commercial and industrial settings. Selective Demolition: In some situations, customers only need specific structures or areas removed. We will work with you to determine what needs to be removed and the best approach to safely, efficiently reclaim the area. Our services include removal of walls, floors and ceilings, as well as equipment. Strip Out Demolition: Plybon's Excavating can work with customers to strip out industrial areas. In this process, we remove all of the interior nonstructural components and equipment to prepare the space for reconfiguration. The exterior walls, floors and ceilings are kept intact. Erosion is a simple word for detachment and transportation of soil particles, and it can quickly cause flooding, sediment problems and instability in industrial, commercial and residential buildings. Make sure your property is properly protected from water damage and erosion. Federal and state laws require most new construction projects to have an erosion plan in place both during and after the project is completed. Plybon's can work with your construction team to install silt fencing, rock check dams and other features to comply with all legal requirements. Plybon's Excavating works with contractors, project owners and other construction professionals to provide dependable erosion control and drainage services. 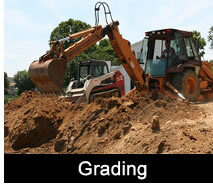 Plybon's Excavating offers full range of earthmoving services to prepare both commercial and residential development sites for the construction of buildings, roads, and parking lots, as well as other projects requiring the land to have a specific grade. We work throughout the Tri-State area, including Huntington, WV, Ashland, KY, Ironton, OH, and the surrounding areas. Contact us today for a free consultation on your site preparation project.